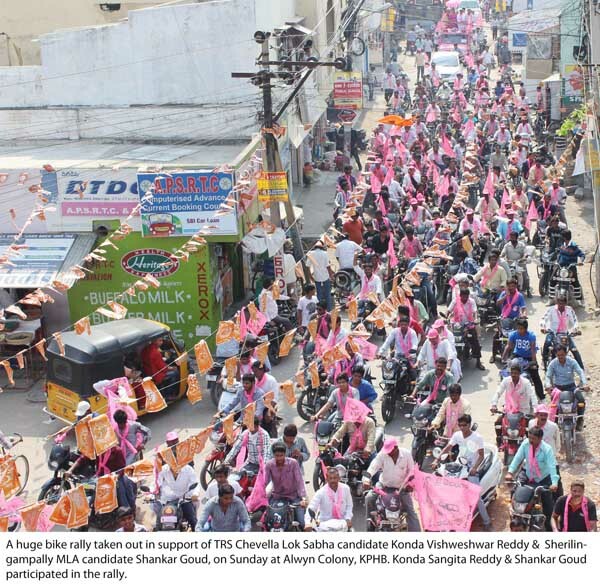 Hyderabad, April 27, 2014: Sangita Reddy participated in a huge bike rally at Alwyn colony, Kukatpally and door to door campaign at Janapriya Apartments, Miyapur, to promote the candidature of Konda Vishweshwar Reddy, for Chevella Lok Sabha constituency on behalf of TRS. Addressing the people, Sangita Reddy said, some political parties with vested interest are calling a section of Hyderabadi’s as settlers and are spreading rumors and fear amongst these sections that TRS will force them out of Hyderabad if voted to power. There is no truth in these, don’t believe in such canards being spread to serve their self interests, she said. Further elaborating Sangita Reddy said, there are no settlers in Hyderabad. Over 85% of people living here came from elsewhere over decades and centuries. This issue of settlers is being raised by people for narrow political gains and has no relevance either today tomorrow or forever. Even at the height of the Telngana agitation no individual or institution was harmed and it is foolish to raise doubts in the minds of these selections of the society. She said Konda Vishweshwar Reddy believes in inclusive growth and is committed to the development of all sections of the society. She requested them to vote for Konda Vishweshwar Reddy as their MP representative.